It’s been a wonderful feeling to get back into the kitchen…i love to cook a good meal for Scott and the kids. They are pretty adventurous and allow me to try new dishes on them often. Over the past months, my presence in the kitchen has been less and i’ve missed it! 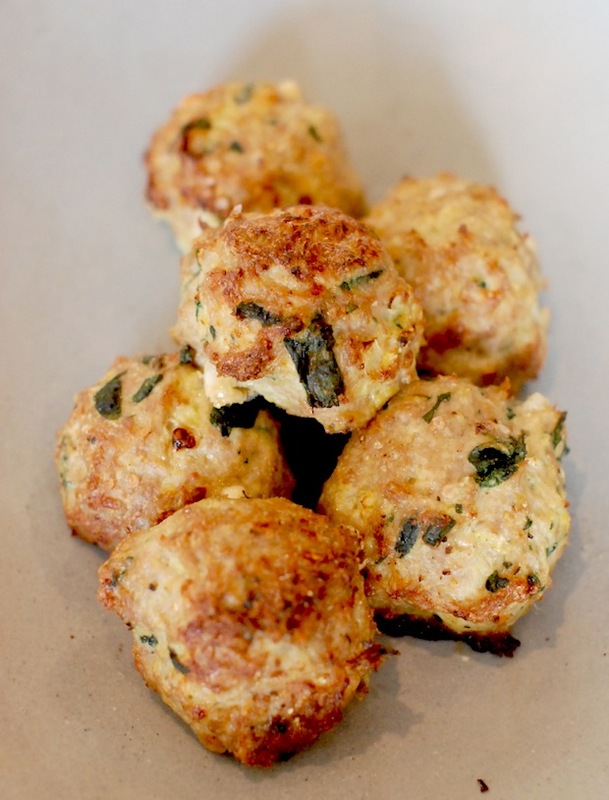 Maybe i didn’t realize just how much i had missed it until i was making these meatballs, with Lexi at my side chopping and garnishing AND taking turns snapping pics for this post. Man, do i love that time with her. She’s gonna be a good cook..she is already…and i really do enjoy having a sous chef. One day, the roles will be reversed i’m sure! 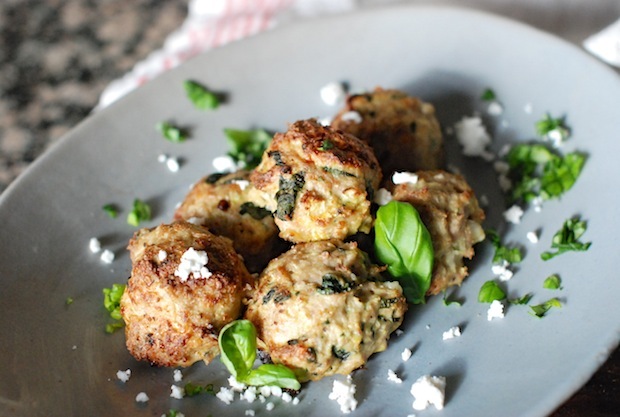 These meatballs are so good…like, really good. I really REALLY think you need to make them because not only are they completely delicious, but they’re healthy too! And not dry. 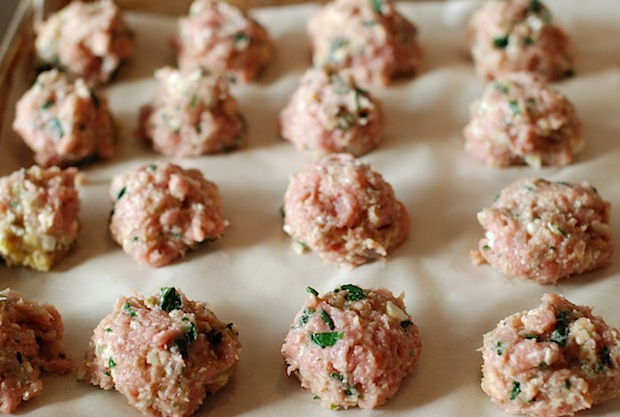 Dry meatballs are the worst, aren’t they? Let’s go so far as to use the “M” word on them. Yes, they are moist. Which is very good in meatball land. These beauties come out of the oven a golden brown at which time you’ll probably notice your family gathering in the kitchen..like dogs to a bone! They smell so darn good! Preheat oven to 450°F. Mist a large baking dish with olive oil cooking spray. In a steamer basket over simmering water to medium, steam baby spinach until wilted, 1 to 2 minutes. Let cool, squeeze out water and chop. 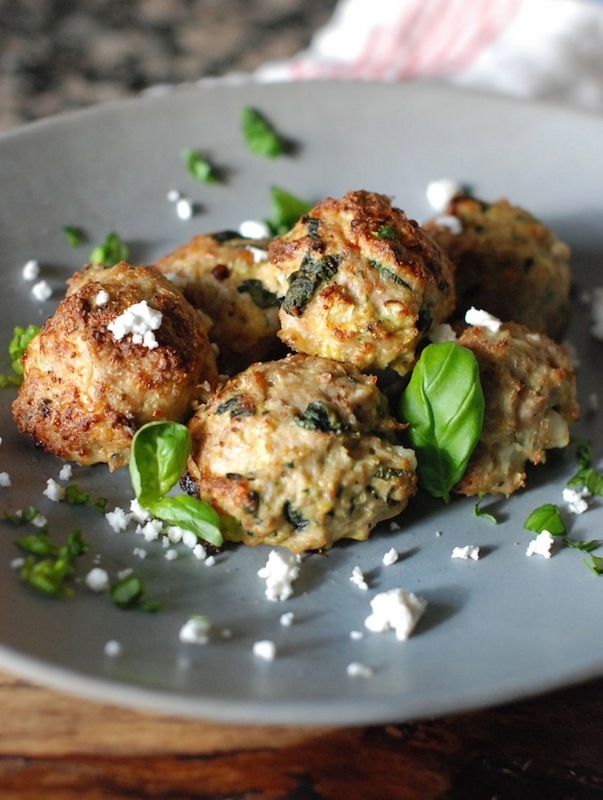 In a large bowl, combine lean ground chicken, minced garlic cloves, lightly beaten large egg, cauliflower, crumbled feta cheese, finely chopped fresh basil leaves, sea salt and fresh ground black pepper, to taste, and spinach; mix well to combine. Use your hands to form mixture into 12 balls. Transfer to prepared baking dish and bake for 15 to 20 minutes, until golden brown and no longer pink inside.